How appealing is the thought of standing on the far end of the driving range with a bucket full of golf balls, repetitiously pounding one after another into vast acreage dotted by a few makeshift greens and bunkers. Oh, and it’s also hot and humid. Most golfers, if they were brutally honest, would take a pass. “Studies show by far that the best way to learn is not to just stand there and beat balls on the range or hit one putt one right after another from the same spot,” said Kelly Mitchum, lead instructor at Pinehurst Resort and Country Club. The traditional mode of repetition practice is being nudged aside for a more purposeful method that can be directly transferred from the range or putting green to the course. For Mitchum, that a-ha moment came about six years ago, following a lesson he conducted with a junior golfer. Mitchum gave the student a short-game challenge to take home and practice. Mitchum, a four-time All-American at North Carolina State and winner of the 1991 Atlantic Coast Conference Championship, knew that if he had been in the student’s shoes, he would have wanted to be challenged in a similar fashion. Mitchum also got to thinking. After some brainstorming, Mitchum came up with EPIC Golf Games. 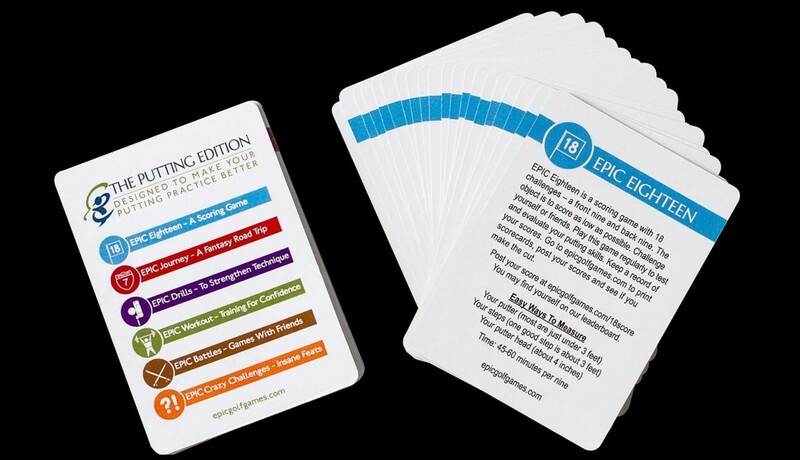 EPIC stands for Engaged Practice In Challenges, and the games are a series of practice drills, games and challenges contained in a deck of playing cards. Mitchum, who tied for second at the PGA Professional National Championship in 2012 and has played in four PGA Championships, initially began EPIC Golf Games with a short game version, a variety of drills within 25 yards of the green. He then created a similar version for the long game, and in 2015 unveiled a putting edition. “For a long time, people thought repetition, repetition, repetition on the driving range or putting green was the most beneficial way to practice. It’s not,” Mitchum said. “In fact it should be a small portion of how you practice. Changing clubs, changing situations and changing targets has been proven to be a way more effective way of practicing. The putting edition features six categories, each being different in its focus and concept. One of the categories, EPIC Challenge, for example, is designed for two or more players. The category includes Around the World, a take on the popular basketball game. Tees are placed at spots surrounding the hole. If a golfer makes a putt, then he moves to the next tee. A player can then take a chance — make it and move to the next tee or miss it and go back to the starting point. The first player to reach the end wins. 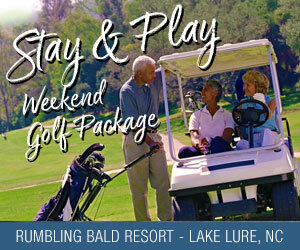 While the initial short game cards were introduced around 2010, the game has only been marketed in the Pinehurst area. With the addition of the putting game edition last year a more concerted marketing initiative is underway. Purdon said the company developed a website (epicgolfgames.com) to create an e-commerce distribution platform, exhibited the product at the Carolinas PGA Show in February and is currently looking for distribution partners within the United States and abroad. The Short Game Edition retails for $12.99 and the Putting Edition for $14.99. The game has potential for broad appeal as it’s not just for individual use. Wake Forest’s men’s golf team integrates the game into its practice regimen and Mitchum uses it with Pinehurst Resort and Country Club members in his putting program. Purdon said the game also addresses one of the key issues facing the game — a premium on time. “We all know the challenges related to growing the game of golf and a number of them are related to time, so if people are going to spend time practicing, we think it should be effective and they should see results from it,” said Purdon, who adds that another use of the cards can be for pre-round warming up. Mitchum said there are plans to revamp the long game edition, but was coy as to what the future may hold. It’s no doubt in the cards, though.